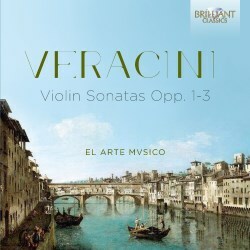 The name Veracini was unknown to me until 1994 when a splendid disc of five overtures appeared on the Archiv label performed by Musica Antiqua Köln (439 937-2). This was in fact music by Francesco Maria Veracini, the present composer's nephew and student. I remember at the time doing a bit of research to find out what I could, which wasn’t a lot. The one thing I did uncover was that the Veracinis were highly regarded as a musical family, with Antonio’s father, the violinist Francesco di Niccolò Veracini running his own music school in Florence. Over the ensuing years the music of Francesco Maria Veracini has been well represented in the catalogue whilst a look at the site of a well known online retailer suggests that this Brilliant CD is the only disc devoted to the music of Antonio. This is a real shame as just listening to this programme makes me want to hear more. Indeed this disc represents a selection of sonatas taken from his first three opus numbers: his opus 1 dating from 1792, his opus 2 from 1794 and his opus 3 from 1796. Antonio is known to have spent the best part of his life playing, teaching and composing in Florence. He only left the city on a few occasions, once to go to Vienna, the other times to go to Rome where he is said to have met Corelli. His music is certainly influenced by that of Corelli and the Italian violin school, as was most of the music composed in Italy during this period, even that of his more famous nephew. His music is strongly rhythmic and attractive. You can hear why the booklet notes say that Antonio Veracini “must be regarded as one of the most prominent composers of his generation, alongside Arcangelo Corelli and Giuseppe Torelli.” Just listen to the Sonata a tre, Op. 1 No. 1 with its brief but beautiful slow movement. The playing of El Arte Mvsico is lively and expressive. I just want to play their excellent recording again and again. The only down-side is that it does not present a full book of his sonatas, I would have much preferred to have a recording that concentrated solely on one opus number. However, this recording soon won me over, and I am more than happy to have it. I will just have to hope that recordings of a single opus number appear soon, and if Brilliant were to consider it as a future project, El Arte Mvsico would be the ideal exponents. The booklet introduces this unknown composer and his music well, and the recorded sound is warm and sympathetic, making this a most desirable disc.